Non user-replaceable battery = no buy. AnonD-168700, 04 Sep 2013Your comment just shows what a troll you are. Saying the S4 design is funny when it has the pe... moreDoesn't want to jump in yours discussion or take sides.But saying that the Note II is best reviewed smartphone is hilarious.Have you ever heard of Nokia N9? I own one,and after two years still going strongly...even compared to latest and greatest.Intended to swap it for GS4,but after hour of playing with it I was NO WAY.About Note II doesn't have any personal experience,but everyone saying it that is on level more or less with S4. AnonD-90736, 04 Sep 2013Oooooh the truth must hurt, I have used and held my brothers S4 so no need to call me a troll ... moreover 40million S4s sold now,you may have found it awful but there are millions who will gladly disagree. AnonD-168700, 04 Sep 2013Your comment just shows what a troll you are. Saying the S4 design is funny when it has the pe... moreOooooh the truth must hurt, I have used and held my brothers S4 so no need to call me a troll you liar. The S4 in every manner is awful, you probably haven't even seen the phone, it's an awful shape, looks nothing like a phone and it doesn't matter what the experts say or illustrate, there is no better way to comment on a phone than to use and hold it. The whole experience is just so bad, I'm sorry but you do need to stop trolling all the time, doesn't do you any good. Would have liked some more info on stylus capabilities. I realise no digitizer, but what about handwriting capabilities?. My Note 2 is crap when it comes to handwriting and I find the the stylus tedious at best. Have read elsewhere that the Ultra Z can be used just like a pen. If someone already has one of these please comment on the handwriting recognition. See....battery is still an issue. AnonD-90736, 04 Sep 2013Both my brothers have the S4, the phone just looks so comical, it's almost emarrassing, firstl... moreYour comment just shows what a troll you are. Saying the S4 design is funny when it has the perfect rounded corners and feels so nice in the hand, unlike this gigantic sharp edged excuse of a phone. Good luck carrying it in your pocket. And for you saying the S4 screen look bad under the sunlight shows how big of a liar you are. Because in this review itself the S4 is in the top 5 of GSMArena sunlight legibility test while the Z Ultra is so far down the rank. And to top it all up you said that Sony has crushed Samsung again, wait what? Lol In what universe has Sony crushed Samsung once?! Let alone again! Lol Samsung has sold way over 100 million of their flagships smartphones alone (that means the S and the Note series) and how many has the Sony smartphones sold?? And the Note II is the best reviewed smartphone ever, how dare you comparing this terribly flawed product to the Note 3! Just stop trolling. AnonD-173086, 04 Sep 2013I have this gadget for a week. I am satisfied. Almost of Samsung smartphone I owned it. S3, ... moreI agree. I hesitated to buy this at first since it looks big and has no flash. 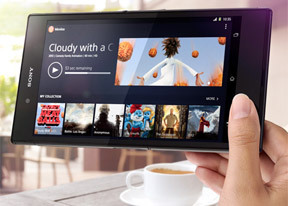 But in my opinion Sony has sacrificed the flash since they want to market this as some sort of a tablet replacement. Since then I sold my Note 10.1 and my Xperia Z. I was partial to Samsung before, having owned most of their recent flagships (and originally a big Apple fanatic as well). But Sony's build quality is quite impeccable, and since then I became a Sony buff. AnonD-90736, 04 Sep 2013Both my brothers have the S4, the phone just looks so comical, it's almost emarrassing, firstl... moreAMOLED is the future of display. LCD display can never bend. LCD can never have "perfect black". LCD will never show full gamut of RGB color space. LCD can show only about 36% of full RGB colour space. Whereas OLED/AMOLED can show upto 98% of full range. If you stick with LCD, you will never have a bendable display in your life. Large phone-small tablet, bad battery life, beautiful screen, good performance, no Wacom digitizer, average camera. Both my brothers have the S4, the phone just looks so comical, it's almost emarrassing, firstly its such a funny shape, it's certainly not a phone, the screen is also a very poor quality, not sure what all the excitement is about, super amoleds are very second rate screen which is why none of the other manufacturers even go anywhere near it. In fact even in normal daylight conditions you can't even see the screen hahaha! how good is that. Really can't wait for the note 3 with its exciting S-Pen hahaha, you lot make me laugh, excited by a pen, you're all desperate because Sony have crushed Samsung yet again. I have this gadget for a week. I am satisfied. Almost of Samsung smartphone I owned it. S3, S4, Note 1 and Note 2 have been sold. Now I only have 2 left, Note 8 and Note 10. Note 8 is okay. But Note 10 is super laggy. But, Z Ultra is blazing fast (despite no s pen). I m not an artist anyway. I like the design, with so many gadget I have (including HTC One, LG Optimus G Pro, Ipad 4, Ipad mini), I dont have a problem with battery life of Z Ultra. I always charge my gadgets every night no matter the battery level left before charging. AnonD-90736, 04 Sep 2013Poor, poor, Samsung fanboys, taken over this Sony forum, in the knowledge that the phablet mar... morethe S4 will probably sell more phones than the XZ, Z ultra and Honami combined... isnt that funny? Poor, poor, Samsung fanboys, taken over this Sony forum, in the knowledge that the phablet market has now been won by Sony, completely shreds the Note 3 to pieces. 6.44" to a plastic 5.7" toy, there is no comparison. The S4 has already failed which is why the talk is already about next years S5 hahaha! The note 3 will also go the same way, just can't wait to buy this Z Ultra, premium class gaming and entertainment device and the photography side looks excellent, who needs a flashlight.